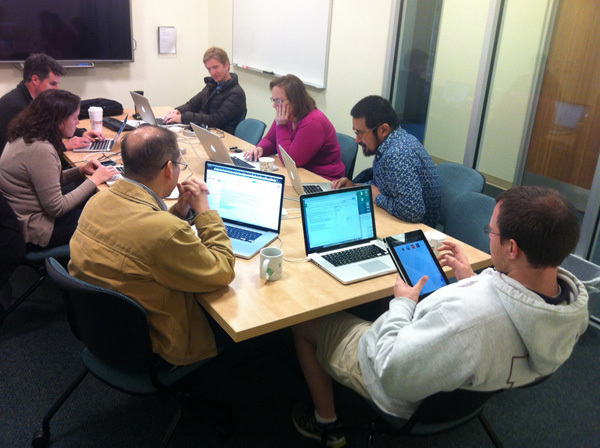 The Doc’ers hard at work reviewing Moodle 2.6. The doc’ers spent a lot of time working with the new TinyMCE implementation in Moodle 2.6. All the icons have been changed to be consistent with Moodle icons, and the order of the icons is different. It also introduces a top-level row of popular icons that can be expanded to include all of the icon options. It also introduces a new button for embedded media files, but we found that it had limited value because it associates a file with a particular text area (e.g. summary description). It doesn’t appear to be fully baked, and folks may want to consider disabling it. They tried out the Single Activity Course format which allows you to configure a course to display a single activity, and nothing else (e.g. no topic blocks). This could be useful for the forum, book, or folder activities when you want a course to be very focused. The PDF Annotator functionality in 2.6 is a work in progress. They discovered a bug (MDL-43595) involving in inability to select colors or stamps. A fix for this is already planned for Moodle 2.6.1. The PDF Annotator does work, and Oakland University’s Eric Merril reports his faculty like it. The annotator touches the PDF itself, so any annotations added can be viewed outside of Moodle (e.g. in Acrobat Reader or Mac OS X Preview). Note: GhostScript needs to be installed on your web server for this to work. The roster report (which allows for a friendly, facebook-style, picture-centric view of a course’s roster) is working in 2.6. The group also discussed how to best setup a Librarian role that respects FERPA concerns. This documentation will be added to the CLAMP Documentation repository. The developers focused on pushing our custom code and third-party code through the integration channels as part of packaging our Moodle 2.6.x release. Testers are being assigned and are attempting to break things. There was also a discussion of Swarthmore College’s work on using LTI to integrate Moodle and WordPress. The service allows a user to log in to Moodle, click on a WordPress activity, and get taken to WordPress, where an account is created for them. It does not sync rosters between WordPress and Moodle. it uses some weird things to create the title of the course, the user name, and the URLs. They are looking at using the email address as the username in WordPress. They are working on making the title of the site the name of the activity plus the course title. They were able to get it to use the shortname instead as the course name for the title of the WordPress site.